The FLC range is available as a completely enclosed light unit, but may also be ordered as an open frame unit. With the 8-13W models, they can be supplied as a complete lighting fixture. 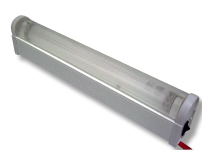 Also we can supply T5 8 Watt and 13 Watt tubes.